Known as “The Glowing Lake”, the phenomena is quite a unique tourist attraction. This lake in Victoria has a fluorescent shade of blue and it feels great to swim in it, midnight. Just when the swimmers come out of this water at night, they are dipped in this shade, which makes them glow! 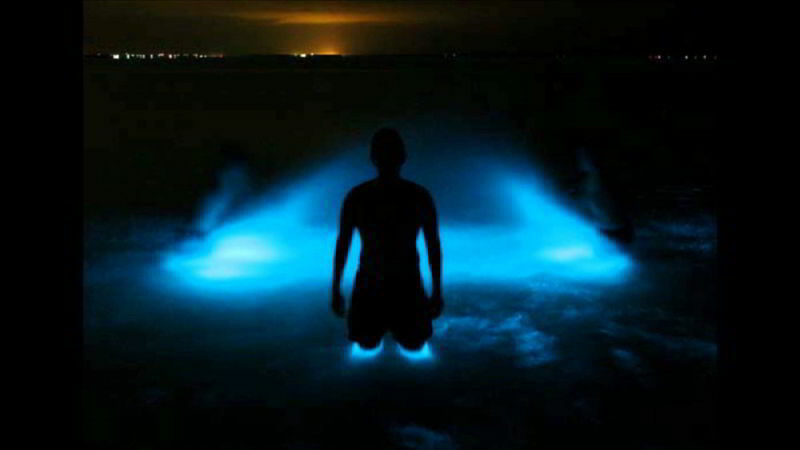 This happens because of a chemical reaction called bioluminescence. The lake is swarming with tiny micro-organisms, called Noctiluca scintillans that have a natural luminescence. These organisms glow a ghostly blue and give the effect that the lake is glowing. This “glowing effect” within the lake is extremely rare and is a very unusual concentration to find anywhere in the world. Phil Hart, a professional photographer, was intelligent enough to take a few photographs of the entire scene, when the chemical reaction was at its peak. When he threw a few pebbles into the water, he noticed that the reaction increased and the water glowed magically. When a few of his friends dipped into the water, he noticed that they glowed, as soon as they came out of it. He said that even though it was funny to see them glowing in the dark, it freaked him out as well! Nobody is used to seeing glowing people and of course, the sight of seeing your friends look like glowing monsters is nothing less than scary! However, at the same time, it is beautiful to see all those wonderful things that the nature has. Mother Earth is blessed with all those things, which only our limitless mind can create. So, who wants to go for a midnight swimming with friends in this lake?